Received 11 April 2018; Accepted 5 May 2018; Published 25 July 2018. I describe the development of nuclear energy in India, its current status and its future prospects vis-à-vis the global trends in the nuclear industry that are also summarized. A short discussion on carbon emissions and global warming is provided to assess the contribution that nuclear energy can make in mitigating the issue of climate change. The progress in India’s nuclear program prior to and in the aftermath of the Indo-US Nuclear deal is compared. The impact of the Nuclear Liability Act of 2010 on the expansion of our nuclear capacity is analysed. Finally, the public concern over radioactive hazards of nuclear energy is addressed. The genuine uncertainties in obtaining a reliable estimate of the damage done by a reactor explosion are pointed out, which make it difficult even for the intelligentsia to assess, on its own, the true extent of the danger. This underlines the importance of government agencies and NGOs dealing with this area retaining their credibility with the public. The subject of nuclear energy, despite its highly technical underpinnings, has generated wide public interest and some controversy over the past few decades, both globally and in our own country. On the one hand, the widely reported accidents at the reactor complex at Fukushima in Japan, and the earlier ones at Chernobyl in the erstwhile USSR and the Three Mile Island in the US, have led to increased concerns about the safety of nuclear energy. Protests based on these concerns have erupted in many countries, with the Green Parties leading the charge in Western Europe. In India too, protests have accompanied the installation of nuclear reactors in places like Kaiga in Karnataka and more recently at Kudankulam in Tamilnadu. On the other hand, the fact that nuclear power is largely free of carbon emissions makes it an attractive form of energy production, given the alarming prospect of global warming and climate change. The latter are caused by the accumulation of carbon dioxide produced during conventional forms of energy generation using coal and hydrocarbons as fuel. Many environmental groups, which had opposed nuclear energy in the past, have had second thoughts about it in view of its possible role in mitigating global warming. In India, reconciling these competing pros and cons of nuclear energy becomes all the more important because of our need to generate a large amount of energy to support a healthy rate of growth of the nation’s economy. The government has to decide how much emphasis it must place on accelerating its development of nuclear energy, along with the other traditional methods of producing electricity using coal, oil, gas and hydro-power as well as exploiting renewable sources like solar and wind energy. Furthermore, at the Paris Conference on Climate Changei India has committed itself to a reduction in C emissions and, to implement that, has announced plans to increase nuclear energy capacity from about 7 GW (gigawatts) currently to as much as 63 gigawatts by 2032 (​Grover 2017​). Whether such an ambitious nuclear target can be reached in the face of several obstacles - the steeply rising costs of reactors, problems of land acquisition, public concerns over radioactive hazards, eventual disposal of nuclear waste etc. - remains to be seen. In this article, I summarize the status and prospects of the development of India’s nuclear energy program and in the process, discuss all the above issues. I will also attempt to address the concerns of the public over the radiological hazards of nuclear energy. In discussing how the Indian program has performed so far and how it is likely to evolve, it will be useful to do so in the context of the global status and history of nuclear energy. Accordingly, I will begin the discussion with a very brief history of nuclear energy around the world, where it has undergone a roller coaster ride ever since it was introduced 75 years ago. It has enjoyed periods of growth and optimism alternating with intervals when further prospects looked very gloomy. In the background of the worldwide trends, I will then discuss India’s nuclear energy program. When the nuclear era dawned, atomic (nuclear) energy seemed to be the ultimate solution to mankind’s energy needs. The US started building nuclear reactors rapidly. Europe and the Soviet Union followed suit. India too started its nuclear program already in the late ‘Forties’. Other developing countries were also encouraged to go nuclear by Eisenhower’s Atoms for Peace program. Thus, in the initial years, nuclear energy seemed to be living up to its promise despite the fact that it involved a completely new area of technology. The dozens of reactors built in the US as well as in Russia and Europe functioned well and generated electricity. Although some countries like France, Russia, China and India continued with their programs, the biggest producer, the US, stopped licensing of new reactors. After building 100 reactors by the 1970s, further growth was frozen for several decades in the US! Germany also stopped increasing nuclear capacity. In fact, some industrially advanced nations like Norway and Italy (which produced Fermi, the Father of nuclear reactors) have no nuclear power reactors. ​​Fig 1​​ shows the levelling-off of nuclear capacity in the world by 1990. In fact, plans to construct new reactors had stopped much earlier, but it gets reflected in the Table only 5–10 years later, after those reactors whose construction had already been started got completed and commissioned. (i) Concern over climate change due to high carbon emission by coal and hydrocarbon-based fuels. To some environmental activists, nuclear energy with a relatively small Carbon footprint began to seem a lesser evil than global warming. (ii) Improved reactor safety features and passage of two more decades of reactor use with no major accidents – making them ‘statistically’ safer. How Much Nuclear Energy Would the Climate Change Mitigation Call for? The field of climate change has generated a vast amount of literature during the past two decades, both on its scientific aspects as well as on its political and economic ramifications. Large and learned tomes have been written on the subject and it would be futile to attempt to summarize them in this article, whose primary theme is nuclear energy. I will, therefore, be content to take as given that excessive carbon emission and the resultant global warming are potentially very serious dangers. I will just show a couple of key graphs on the extent of carbon emission and possible ways to reduce it in the future. I will use a pioneering piece of work by Pacala and Socolow which gave a simple and tractable encapsulation of this complex subject and discussed ways to mitigate further C emission through a variety of measures, including nuclear energy (Pacala and Socolow 2004). Fig 2​ below, taken from their work, shows the measured growth of annual C emission over the years. From 1954 to 2004, when their work was published, the measured annual carbon emission data follows, apart from some smaller wiggles, roughly a straight line as shown in ​Fig 2​. The graph shows the annual global carbon emission in gigatons. In 2004, as the graph shows, the annual C emission was already about 7 gigatons. This level of emission, if continued year after year, would already be considered unsafe from the climate change point of view. But if the emission rate itself continued to increase as it has in the past (i.e. if the world continued on a ‘business as usual’ path) then we have the emission trajectory going up to 14 gigatons by 2054, which, as per all reasonable estimates by most experts, would be truly disastrous. Given this, Socolow argues as follows. Suppose we consider even the modest goal of keeping the emission rate at the 2004 level, i.e. at about 7 gigatons of carbon per year that would already be a hard thing to achieve. To appreciate this, note that the total quantity of carbon emitted is (with appropriate units on the x and y-axis of the graph) the area under the rate curve of ​​Fig 2​​. 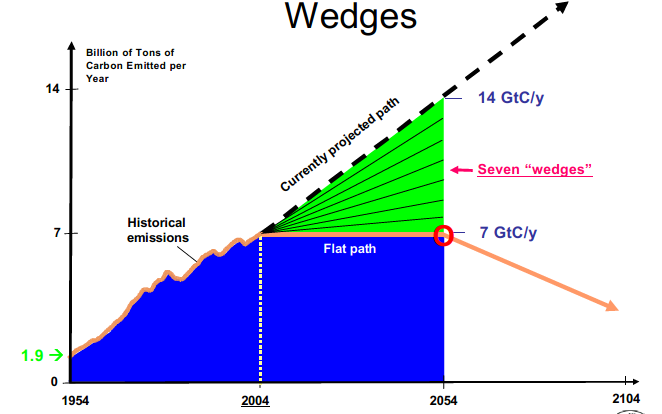 Therefore, if we wish to maintain the annual rate of C emission at the 2004 level of 7 gigatons, we have to either live without, (or replace by some other source) the energy that would have been produced by the amount of carbon in the triangular area shown in green. To get some tentative idea of possible ways to deal with the loss of that much carbon-based energy, Socolow divides the green triangle (he calls it the Stabilization Triangle) into 7 equal portions, each a triangular wedge as I have shown in the figure. Each wedge represents carbon emissions whose annual rate would grow from zero to 1.0 gigatons of carbon (GtC)/yr. over the course of 50 years. He then considers different measures to replace the loss of each wedge’s worth of coal-based energy. Some examples are shown in ​​Fig 3​​. Possible ways of compensating for the loss of hydrocarbon-based energy production. Note that the Pacala-Socolow analysis was published in 2004, using the C emission graph till that time, as shown in ​​Fig 2​​. Subsequently, the rate of Carbon emission has grown even steeper. ​​Fig 4​​ contains the annual emission data up to 2014, which shows a more rapid rate of emissions since 2004. This makes the burden on nuclear energy for replacing 1/7th of the total fossil fuel energy even higher, well over 1000 GWe. 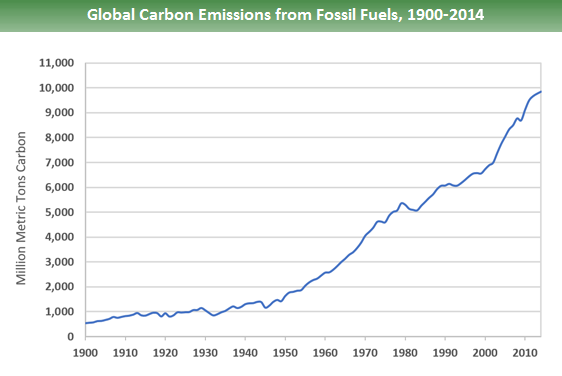 Global Carbon emissions from fossil fuels from 1900 to 2014. Source: Boden, T.A., Marland, G., and Andres, R.J. (2017). Global, Regional, and National Fossil-Fuel CO2Emissions. Carbon Dioxide Information Analysis Center, Oak Ridge National Laboratory, U.S. Department of Energy, Oak Ridge, Tenn., U.S.A. doi 10.3334/CDIAC/00001_V2017. One can ask if the world has enough uranium ore under the ground to support over a thousand reactors, each of 1 gigawatt power. 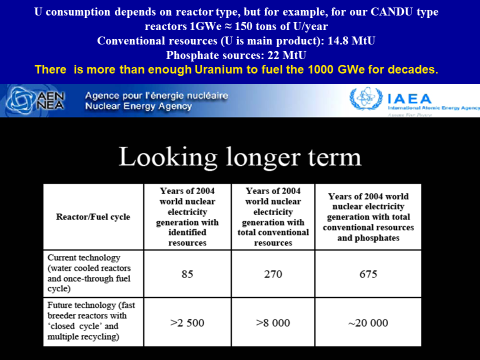 ​​Fig 5​​, prepared under the aegis of IAEA (the International Atomic Energy Agency), gives the availability of global uranium resources, with estimates of how long it will last. This is calculated both using conventional ‘once through’ technology and using closed cycle technology with fast reactors. The entries in the Table are self-explanatory and the short answer is that there are plenty of uranium resources to fuel 1000 Gigawatts nuclear energy for a century. 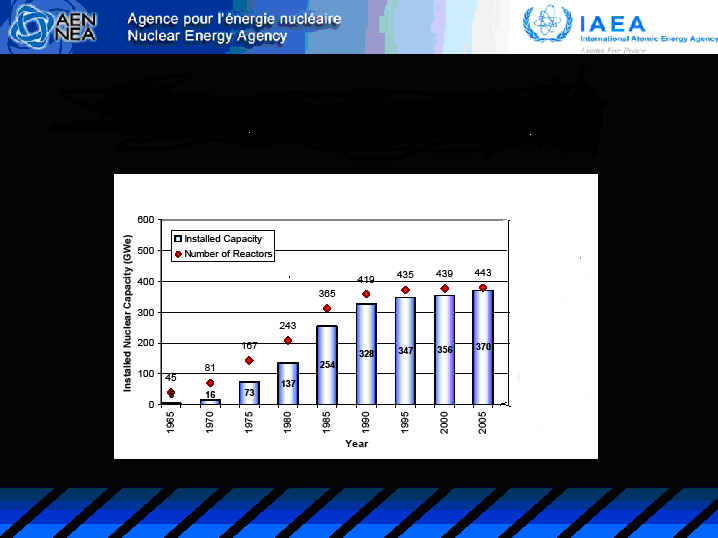 Estimate of the number years of nuclear power that can be sustained by available global uranium reserves, as given by the IAEA. So, with climate change compulsions thus providing a new impetus for building more reactors, and sufficient availability of uranium ore underground to support them, things began to look rosy again for nuclear energy in the new Millennium. But, then came Fukushima! Thanks to massive television coverage around the world, the Fukushima reactor explosions in March 2011 had a massive impact (more than the larger disaster at Chernobyl) on public perceptions of nuclear energy. The nuclear industry, hoping to enjoy a ‘renaissance’ had instead to face charges of being unsafe and expensive. Anti-nuclear activists worldwide felt freshly empowered and demanded closure of nuclear reactors. Different countries responded differently to Fukushima. Germany decided to phase out its entire nuclear program in a decade. The US, the UK, Russia and China conducted safety reviews to the extent they saw fit and decided to continue with their nuclear energy plans, but in a more cautious manner. UAE has gone ahead with plans to build 4 reactors in an $18 billion deal with South Korea. What about India? That brings us to our own nuclear program. In the background of this global history, let us discuss the Indian program. Thanks to the pioneering vision of Dr. Homi Bhabha and the support he got from Pandit Nehru, our nuclear program had formally begun already in the late forties, before most nations. Since then DAE (The Department of Atomic Energy)​ ​5​​ has been enjoying strong support from the Government. It grew steadily but slowly. In more than 5 decades, by the end of Millennium, they had only been able to develop a capacity of less than 3 GWe. The list of power reactors in DAE’s stable by the year 2000 is given in ​​Table 1​​ (The current list will be shown in ​​Fig 6​​). Why was the Development so Slow? Some people also feel, rightly or wrongly, that there was too much awe of DAE and insufficient pressure on them to push harder. If true, this may have been the flipside of the enormous support DAE has enjoyed, thanks to Bhabha, Nehru and the Bombs. Be that as it may, notwithstanding the relatively slow rate of development in India’s nuclear program in its first fifty years, the new millennium saw a decisive push for faster and more substantial increase in our nuclear capacity. 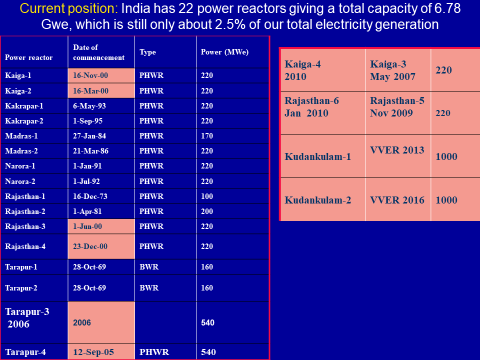 By 2010, ten more indigenous reactors were completed and commissioned at Kaiga, Tarapur and Rajasthan. The government had also brought out a new Integrated Energy Policy document outlining the energy required to enable an 8% Growth in GDP (Planning Commission 2006). Table 2.7 of that document sets the targets for energy production from different sources during the next 2–3 decades. Excerpts from these targets are summarized in ​​Table 2​​ below. Targets for different energy sectors taken from the Integrated Energy Policy of 2006, Government of India. One can see that this plan calls for generating 26.1 GWe of nuclear energy by the year 2022 and 31 more gigawatts in the ten years after that. These are obviously very ambitious targets considering that at the time of the preparing the Planning Commission Report, we had less than 4 GWe of nuclear power altogether. (ii) enter into collaboration with other countries on building reactors. After 3 years of hard negotiations, the Indo-US Nuclear Deal was concluded in 2008 and the nuclear sanctions against India were lifted by the Nuclear Suppliers Group Countries (Rajaraman 2009). Let us look at the extent to which we have so far been able to take advantage of the new freedom on nuclear commerce. Although we are short of Uranium ore, we do have large deposits of Thorium. It has been repeatedly suggested that we use our Thorium for fueling reactors. In this box we briefly address the Thorium possibility. Thorium is NOT a fissile material, i.e., it cannot undergo nuclear fission. But it can be converted, when placed in a ‘Fast Breeder’ reactor, into U(233) which is fissile. The U -233 deposited in the spent fuel can be extracted in ‘re-processing units’ and used as an input fuel, closing the ‘fuel cycle.’ This is the Bhabha Plan. In principle, it is a good plan. But on a commercial scale, such Breeder technology is nowhere nearly as sturdy as conventional reactors. Among a total of 443 commercial reactors in the world, there are only a couple of functioning breedersThe US and Germany long ago gave up on commercial Breeders. France and Japan had only one each (the Phoenix and the MONJU respectively). Both had major coolant (liquid Sodium) problems and have been abandoned. China has put its Breeder plans on the backburner. Only Russia has a couple of Breeders. India’s first commercial Breeder is still under construction at Kalpakkam. Our DAE scientists claim that they have devised, despite their isolation, new techniques to manage the sodium safely. It was supposed to be ready in 2010 but is still not, 7 years later. We have a long and challenging task ahead (at least 20 more years) to achieve commercially viable energy using Thorium. Meanwhile, we have to rely on Uranium for fuel. On uranium purchase, the Government has moved fast and organized the purchase of Uranium from several countries. Agreements were made to enable purchases of Uranium from Kazakhstan, Namibia, Mongolia, Niger, Canada, and recently Australia. Till now, about 5,559 MT (metric tonnes) of Uranium has come into the country from the Russian Federation, Canada and Kazakhstan, alongside France, while 2,937 MT is the anticipated supplies of natural uranium ore concentrate and natural uranium oxide pellets. On importing reactors, i.e. on arranging for reactor builders from other countries to construct reactors in India, progress has been hindered by several factors. This is unfortunate because it is a crucial element in our plans for nuclear expansion. On its own, the DAE has been able to build reactors only slowly and even those were limited to only one type of reactors, the PHWRs (Pressurised Heavy Water Reactors) of relatively small capacity. To their credit, the DAE scientists have been able to upgrade and operate larger versions of that reactor, starting from the earlier ones of 220 MWe each to bigger ones of 500 MWe and now 700 MWe capacity. But to have a substantial up to date nuclear capacity, one needs to have a fleet of modern Light Water Reactors in the range of 1000 MWe and higher. Note that even though the US under President Bush exerted itself considerably on India’s behalf and did all the heavy lifting to persuade other countries to remove the nuclear sanctions against India, there was no requirement in the Indo-US Deal that India must buy any US-built reactors. In fact, once the Deal was done, Russia and France, which were waiting for the sanctions to be lifted, also signed, along with the US, initial agreements for construction of reactors in India. NPCIL quickly entered into preliminary agreements and MOUs with Westinghouse on the construction of AP1000 Pressurized Water Reactors (PWRs), and with GE Hitachi for the construction of Advanced Boiling Water Reactors of the capacity of 1350 MWe each. These US reactors were to be built at Mithi Virdi in Saurashtra, and Kovada in Andhra Pradesh. Meanwhile, the French reactor building giant AREVA was allotted a reactor park at Jaitapur in Maharashtra. They are expected to build six EPR (European Pressurized Reactor) units with a capacity of 1650 MWe apiece. The Russians were offered a ‘reactor park’ to be located at Haripur in West Bengal to house eight 1000 MWe VVER reactors. But that venue had to be shied because of objections from the West Bengal government. But the Russians had already started building two reactors for us at Kudankulam even before the international sanctions were lifted. The sanctions were bypassed using what is known in the trade as ‘grandfathering’, i.e. claiming that the agreement to build them had preceded the imposition of sanctions. Other countries tacitly looked the other way (this seems to happen often in the international community). In fact, the Chinese are building two reactors near Karachi using the same argument! However, progress in bringing the agreements with all these three countries to fruition ran into a roadblock because of India’s newly enacted Nuclear Liability Act passed in 2010​ ​3​​. The Act had several progressive measures including (i) a Reactor-operator liability of $300 million and (ii) a requirement that a claim for compensation by a victim will have to be dispatched by a special court within 3 months of application and the award accordingly made. Compare this with the experience of victims of the Bhopal Gas Leak tragedy! But the Liability Act also contained a clause permitting the Operator to sue the reactor Suppliers in the event of an accident or malfunction. On the surface, such supplier liability may sound reasonable. If a car accident took place, not only are the owner and driver liable but also the manufacturer, if faulty car parts were proved to be responsible. Nevertheless, in the nuclear reactor commerce, such a liability clause went against international practice. No other reactor buyer country includes such a condition. Not unexpectedly, all the suppliers from the US, France and Russia were unhappy with the supplier liability clause. There was also concern that no insurance companies would be willing to cover the risk on behalf of the suppliers. The government tried out many ideas to assuage the concerns of the foreign suppliers, but reactor builders were not persuaded. Further agreements came to a grinding halt with no forward motion between 2010 to 2013. Eventually, a mutually acceptable solution was found through the formation of an Insurance Pool. The Liability of Rs. 15 billion in the event of an accident would be split between GIC (The General Insurance Corporation of India) and four other insurance firms and the Government would provide more at a later date ‘on a tapering basis.’ The additional insurance costs for the suppliers would be partly absorbed into the purchase price in the agreements. Things began to move again. Since then, the most progress has been on Russian reactors. As mentioned earlier, the Russian nuclear giant ROSATOM ​​4​​ had already been building two reactors for us at Kudankulam after bypassing the nuclear sanctions on the argument of ‘grandfathering.’ After the sanctions were lifted, the Russians agreed last year to build two more 1000 MWe reactors (units 3&4 at Kudankulam) for $2.5 billion each, which will generate electricity at Rs. 6 a unit. The price was adjusted to include nuclear liability costs. Of these, Unit 3 is scheduled to be completed in March 2023 and unit 4 the subsequent year. India and Russia have also signed an agreement for another two reactors (5&6) at Kudankulam. The entire project will cost about $ 7-8 billion. The first unit will be commissioned in 66 months and the second six months thereafter. The Russian collaboration is the only one going full steam at the time of writing. By comparison, things look dismal on the Western Front. After the liability concerns were resolved, it was announced during Mr. Modi’s Washington visit in June 2016 that NPCIL and Westinghouse will immediately start engineering and site design work. The six Westinghouse AP-1000 reactors would be built in Andhra Pradesh after the original site in Gujarat faced local opposition. NPCIL reportedly made a down payment on 2,000 acres (800 hectares) of land in the coastal district of Srikakulam. However, even though new agreements were made with the US and French companies, their prospects are very bleak now. Both the reactors firms seem quite dysfunctional now with serious the financial solvency problems. Westinghouse has announced bankruptcy. Its parent company Toshiba, does not want to bail it out. It is not clear how they can build the 6 reactors for India. Moreover, GE has announced that it would not enter into a similar arrangement because of continuing liability concerns. There has been a very recent development with regard to Westinghouse. The Canadian company Brookfield has agreed to buy out Westinghouse. Since Canada is involved, it is unclear whether the construction deals will need a new nuclear agreement with Canada. It remains to be seen how this will proceed further. Prospects of the French collaboration also look gloomy. Areva has reportedly agreed to a price of Rs.6/kWh – up from the earlier Rs. 3–4/kWh with some ‘Make in India’ collaboration with the Indian company Larsen and Toubro. But Areva is also broke. In late 2014, Areva suspended its financial outlook statement due to cash flow problems. Soon thereafter Standard and Poor lowered its credit rating to BB -- (junk status). The French government has been on a re-organization and rescue operation for Areva. Besides, Areva has had a terrible record in constructing their EPR reactors – the same model that they wish to sell us. Their EPR reactor in Olkiluoto, Finland, started in 2005, is still not ready. Meanwhile, the cost has gone up from €3.7 Million to over € 8.5 billion. Even within France, another EPR reactor at Flamanville started in 2007, is not ready yet. Its cost too has shot up from €3.3 billion to €8.5 billion. However, similar EPRs are being constructed by Areva in Taishan, China at reportedly €4 billion each and suffering fewer delays. We should carefully monitor their progress. All in all, the program to import reactors from the US and France is proceeding forward slowly and is well behind schedule. Perhaps in part because of this, India has announced a program of building 10 new indigenous reactors. Presumably, this is in response to the problems with both the France and US reactor projects. These would all be CANDU reactors of 700 MWE each. At the time of writing, all these are still plans and the current set of functioning power reactors is given in ​​Table 1​​. Their collective installed capacity is 6.78 GWe, including a significant fraction of 2 GWe coming from the Russian built reactors at Kudankulam. Altogether that represents less than 3% of our current electricity requirements. Readers are also encouraged to look at the DAE perspectives on these developments. There are several excellent articles by Dr. R. B. Grover, a member of India’s Atomic Energy Commission for several years, on our nuclear program. His review published last year is a good example (​Grover 2017​). In the early years of nuclear energy, there was not much concern, except among experts, about what would happen to the contents of a reactor after use. These contents would be, in the first instance, its spent fuel rods as they get used up are removed and replaced, and eventually of the whole reactor itself after it completes its usable life. The focus in the initial years was on designing, building and running the reactors successfully to generate power. But as the decades rolled by, the reactors began to age and their spent fuel rods started accumulating. Gradually public consciousness began to get raised on the importance and cost of dealing with the highly radioactive content of used reactors and their fuel. Let me briefly explain what the spent fuel disposal problem is. A typical power reactor’s fuel consists of uranium, which is primarily made of the isotope U-238 which is NOT fissile and smaller amount of U-235 which is its source of fission energy. (Some reactors have mixed fuel containing plutonium as well, but most of what we say in this introductory discussion applies to them too.) The fraction of U-235 in the fuel depends on its ‘enrichment’ level. ‘Natural’ Uranium extracted from Uranium ore has about 0.7% of U-235. Such natural Uranium is what is used in the Heavy-Water Moderated CANDU reactors – the workhorse of the Indian reactor stable. Most reactors in the world are Light-Water Reactors, which need Uranium that has to be enriched to 3–4.5 % of U-235, generally done in gas centrifuges. This Uranium is machined into ‘fuel rods’ which are bundled together to form the fuel assembly placed at the reactor’s core. As the reactor burns its fuel its U-235 content keeps getting diminished until it reaches a level that is no longer sufficient to generate the required rate of fissions to keep the reactor running. At that stage, these ‘spent’ fuel rods are removed and replaced by new ones. The spent fuel rods contain various highly radioactive elements - not just the original Uranium isotopes but other nuclei, produced by the impact of neutrons generated in the reactor, plus their subsequent decay products. The problem of disposal of fuel rods is to find ways of storing them away safely so that their radioactive emissions do not harm people and the environment. The storage of spent fuel is still a ‘work in progress’ in many countries which have not determined the ultimate fate of their spent fuel. The problem is not just that large quantities of spent fuel are piling up as several hundred reactors around the world steadily generate tons of them every year, but also the fact that many of these radioactive elements ‘rot’ very slowly, i.e. have very long half-lives. They would continue to be radioactive for tens of thousands or even millions of years and would have to be reliably stored for such durations. This imposes an unprecedented ethical and moral responsibility on current users of nuclear energy - to protect not only themselves, their children and grandchildren from radioactivity but hundreds of generations thereafter. The storage of spent fuel is a vast and technically complicated subject unto itself, involving such disparate specialisations as nuclear physics, geology, reprocessing chemistry and so on. We cannot begin to do justice to cover that here. But readers are referred to a very lucid, detailed and expert review of both the technology of spent fuel storage and of how different countries are dealing with the problem, published by the International Panel on Fissile Materials (​IPFM 2011​). As this review points out, already by the end of 2009 there were about 240,000 metric tons* of heavy metal (tHM, mostly uranium) that needed to be stored safely. As of now most of it is stored at reactor sites. In the short run, the storage problem has been handled well in most countries. After removal from the reactor vessel, the spent fuel rods are first kept immersed for years in large water tanks installed nearby within the reactor complex, until they cool down. After its cooling in water tanks is over, there are two different ways the fuel is dealt with subsequently. Some countries, like the US, employ the Direct Disposal method whereby, after cooling the spent fuel is removed from the water tanks and kept in dry-cask storage i.e. placed in steel canisters that are surrounded by a heavy shielding shell of reinforced concrete, with the shell containing vents allowing cooling air to flow through to the wall of the canister. These dry casks are then stored within the reactor sites or in some cases in a centralized facility. Other countries, like India, employ a Closed Cycle program whereby the fuel rods are treated chemically in ‘reprocessing’ units where the fuel is dissolved in acids and the plutonium and uranium recovered from it for potential use as reactor fuel. Even after the recovery of Pu and U, there is still a residual ‘high level’ waste which includes the more radioactive elements in the spent fuel. It is this high-level reprocessing waste from spent fuel that requires suitable storage for periods ranging from tens of thousands to up to a million years to minimize the releases of the contained radioactivity into the environment. It is generally believed that the ultimate storage of the directly disposed of spent fuel and the high-level radioactive waste will require well-designed underground repositories, hundreds of meters deep, where the surrounding rocks and soil will prevent the escape of radioactivity. Most experts believe that this can successfully prevent the escape of radioactive materials to the biosphere for thousands of years. Turning the particular case of India’s own spent fuel, the problem is still in its early stages since our nuclear program is not as large as those in other industrial nations and consequently there is not much spent fuel to contend with. Typically, about 600–700 tons of spent fuel is generated each year. Our spent fuel policy involves a ‘Closed Fuel Cycle’ wherein we recover the Plutonium and Uranium in the spent fuel rods by, as outlined above, treating them with chemicals in Reprocessing Plants. We have three Reprocessing Plants at BARC, Kalpakkam and Tarapur. The recovered Pu and U which constitute about 97% of the spent fuel is then re-used again as fuel for other reactors. After separating out the PU and the U, it still leaves behind 2–3% of the spent fuel as ‘high-level waste’ consisting of other radioactive elements. A clear summary of the way India disposes of this high-level waste has been provided in an official statement made in the parliament. ​ ​3​​ As summarized here, the High-Level Liquid Waste is first vitrified, i.e. immobilised into an inert solid vitreous (glass) matrix. Then it is packed in specially designed storage vaults and allowed to cool for a period of 40–50 years. These vaults have so far been stored within the reactor complexes. Eventually, this cooled vitrified waste will have to be disposed of in some geological disposal facility. That as far as we know is where matters stand on dealing with spent fuel in India. The storage of the high-level waste in dry casks at the reactor complexes should work for several decades. For the long run, as far as we know, no specific location has been identified so far for the geological repository. Finally, let us turn to the subject that, rightly or wrongly, worries a lot of people. The Fukushima reactor explosions had a massive impact (much more than the bigger Chernobyl accident) on public perceptions of radioactive hazards associated with nuclear power. Even though India conducted a full safety review after Fukushima and decided to continue with its plans for expanding nuclear power only after that, it did not assuage the concerns of anti-nuclear activists and NGOs. They organized major protests against the proposed new reactors, especially at Kudankulam where two Russian-built reactors were getting ready to be commissioned; surprising, since traditionally in India protests were rarely aimed at Russian-built facilities (such has been the impact of Fukushima and the collapse of Cold War behavior patterns). Another site allotted to the Russians at Haripur in West Bengal also has to be relocated because of the opposition from Trinamool Congress party. Similarly, Areva’s EPR reactors planned at Jaitapur on the west coast has been met with local opposition. Protests were also organized during President Hollande’s visit to Delhi. As it happened, even the Kudankulam protests, which were the most sustained anti-nuclear demonstrations that India has seen and which got substantial exposure in the media for several months, could only delay the commissioning of the reactor, and not stop it. Both the reactors at Kudankulam got completed and now generate electricity for the grid. I will not go into the very interesting question of why such protests against nuclear reactors, or for that matter the far more serious issue of nuclear weapons, have not been successful. But what is relevant to our discussion is the fact that even though these protests could not stop the development of nuclear energy in India, the fear of nuclear radioactivity continues to haunt many members of the public. This fear must be understood and dealt with sensitivity. I’d think that the public, by now, is inured to witnessing both in their real life and on the television, different types of disasters like fires, earthquakes, chemical explosions as in Bhopal, terrorist attacks and full-scale wars. Why are they so afraid of radioactivity? There are several reasons. Unlike fires, bullets or chemical burns, with which mankind has been familiar for a long time, nuclear radiation is new and terrifying. It is invisible, has no smell or color. In many cases of radiation exposure, apart from skin burns, there were few initial signs of the terrible damage that has been done to the interior of the body. This inability to detect nuclear radiation with the human senses, and the fact that the after-effects of exposure may not develop until years later, has created a near-irrational dread in the public mind. The grizzly photographs of those killed and injured by nuclear radiation during the Hiroshima-Nagasaki bombings have formed a profound and enduring impression about the horrors of radioactivity. In many ways, this dread of radioactivity has had a beneficial impact on human society. It has helped develop an unwritten taboo against any nuclear bombings after Hiroshima and Nagasaki. This taboo has held so far and has greatly helped various movements for nuclear disarmament. But the hazards of radioactivity in the context of a civilian nuclear energy, although they are definitely present, have been greatly exaggerated. Nuclear reactors are not nuclear weapons. Even when they explode, as they did in Chernobyl and Fukushima, the effects are far smaller in intensity by a factor of million as compared to a nuclear bombing. In particular, in the absence of a major accident, the hazards posed by a normally functioning reactor are truly small. The facts about the extent of radioactive dosage in the environs of a normal functioning nuclear reactor are reliably known (​Apte 2014​). The annual dose from a typical Indian reactor at a distance of 1.6 km radius varies from 0.0004 to 0.04 mSv (millisieverts). One can see that the radiation dose for the public living in the vicinity is minuscule compared to the other doses of radiation we all receive from the different sources listed in ​​Table 3​​. DAE frequently points out that villagers who live in areas adjoining the nuclear plants do not seem to have suffered statistically significant incidents of cancer or genetic damage which can be traced to radioactive exposure. For those who tend to distrust such official statements or the technical data in milli-sieverts, let us offer the following compelling commonsense evidence. The thousands of employees working in our reactor complexes do not consist of illiterate citizens who do not know about the possible hazards. They in fact include technically highly trained scientists and engineers. The highest brass in DAE have had their offices located within BARC and other reactor complexes. They have all survived decades of whatever radiation exposure a reactor’s neighborhood carries, lived their full lives, and produced healthy children and grandchildren. This is something sceptical members of the public can easily check since some of the top scientists who have served in DAE are also well-known public figures! Of course, these comforting arguments hold only when the reactors are functioning normally without any serious accidents. There is no doubt that accidents like the ones at Three-mile Island, Fukushima and Chernobyl (in increasing order of the scale of damage) constitute major disasters. But even there, before deciding policy changes on nuclear industry as a whole because of possible accidents, we have to first find some reliable way of estimating the damage done by a given nuclear accident. After all, we do not close down all chemical plants involving hazardous gases despite the terrible Bhopal tragedy, or all metallurgical production because of the poisonous effluents that it spews into our rivers. But calculating the likely effects of a reactor explosion is not easy and estimates of human fatality vary widely. At one extreme, there are claims that only about 30 people died due to the Chernobyl accident and hardly one or two due to Fukushima. These seem like absurdly small numbers but they are technically correct if you demand a rigid causal connection of the deaths to the accident. The 30-odd people at Chernobyl were plant workers sent in to clear the mess after the explosion and died later due to radiation sickness. In the case of Fukushima, no one was allowed to go into the reactor building. As a result, there were zero deaths recorded at Fukushima even a week after the explosion. But in reality, many more people would have died or been seriously affected in the subsequent months and years by the Fallout, i.e. the radioactive particles carried by the winds from the reactor site to the neighboring areas, up to hundreds or even thousands of miles. These deaths, mostly through cancers that take a long time to develop can happen years or decades after the radioactive exposure. While the amount of radioactivity carried to any given location by the Fallout can be measured quite precisely, what is less precise is an estimate of the damage that the radioactive dose would have done in the form of cancers or genetic mutilation. Epidemiological techniques will not be very successful since these cancer incidents will not any carry any special signature indicating that they were caused by the radioactive fallout coming from the reactor. They will be buried in the much larger total number of cancer deaths caused by other factors. Therefore, getting a reliable count of such fatalities, scientifically attributable to the reactor accident, will be difficult, except in special situations such as children living in the path of the Fallout who suffer an unusually large incidence of Thyroid cancer. There are also ‘theoretical’ estimates that biologists can make using models of genetic damage based on laboratory experiments. Here too, models differ. In particular, there are models that assume that there is no genetic damage below some minimum threshold of radioactive dosage. This would imply that in estimating casualties, one can leave out distant regions where the radiation dose falls below that threshold. By contrast in the ‘no-threshold linear models’ any radioactive dosage however small carries some correspondingly small but non-zero probability of causing cancer. These models would estimate a much larger fatality count since it would include an integral over low probability contributions from all distances. There has been much study and scientific discussion about whether there is a threshold or not. In fact, a major study conducted by The US National Academy of Sciences was devoted to addressing such issues. ​ 6​ Despite that, not all scientists are convinced of the no-threshold model. Thus, even in the absence of any contentious political or ideological prejudices, there are genuine scientific reasons behind large differences among estimates of reactor accident casualties. On top of that if we superimpose ideological and professional biases on the part of the die-hard pro- and anti-nuclear commentators then the impact of nuclear accidents can vary wildly from just a handful according to some, to tens of thousands according to others. That can leave even an intelligent layman confused. (For a fuller discussion of the effects of radioactivity as well as a scholarly critique of India’s nuclear program as a whole, see ​Ramana (2012)​). It would be foolish to claim, as some nuclear enthusiasts do, that nuclear energy is 100% safe. No large-scale high-tech operation ever is. But we have to compare whatever danger is associated with nuclear energy with the hazards associated with other sources of power, their relative advantages and costs. Solar and wind energies are possible alternatives which, in addition to being truly renewable, involve far fewer hazards than nuclear energy. These renewable sources merit a full discussion in their own right and we cannot do that here. In summary, wind energy is already being supported substantially by the Government and by private companies. The problem with wind is that its speed and availability are not in our hands. As a result, the capacity factor of windmill generators is 15–20%. Solar energy was considered too expensive for a long time but in recent years, its prices have crashed and entrepreneurs are coming up with very competitive bids, offering power at amazingly low rates often below ₹3 per unit. The present government is also strongly supporting the growth of solar energy. The Prime Minister has announced a target of 100 GWe for solar energy as part of our response to the Paris Accord commitments. If the low costs of renewables like solar and wind energies continue to hold, it may well be that they will soon make up a much larger chunk of our energy basket than nuclear reactors. But it would be unwise to phase out nuclear energy totally, even in the long run. It carries many advantages such as producing a steady base level input into the electric grind, having a very minimal carbon footprint and occupying much less land area per megawatt than other sources of energy. To the extent that the prospect of another (low-probability albeit dangerous) nuclear accident may legitimately cause concern, it has to be compared with hazards from many other technologies and industries that we live with, to fulfil requirements of modern life. The actual hazards of generating power from any source, whether it be nuclear or carbon-based, have to be balanced in some meaningful way against the hazards of no power. According to some claims, a hundred thousand villages do not have electricity to any significant extent. Unlit roads are unsafe for women, unlit homes and kerosene lamps are bad for children’s eyesight, lungs and education, rural hospitals with constant power breakdowns can be deadly. Has anyone estimated the effective fatalities due to these? Governments, as well as social activists, must be pro-active in educating the public about nuclear hazards, but in a responsible and balanced manner. Neither bland assurances nor the stoking of hysterical fears will serve the public good. The events at Fukushima have unfortunately damaged, worldwide, the credibility of official assurances in the public’s eyes. At Kudankulam, even personal assurances by Dr. Abdul Kalam, a widely respected and popular past President did not make a significant impact on the protestors. The problem also is that even the general intelligentsia, let alone the lay public, does not have the technical background for making up its own mind about nuclear safety. It has to take someone’s word for it. But, who will give them required assurances when the people best qualified to do so are increasingly disbelieved? So nuclear agencies everywhere, not just India, must work to regain public trust, especially in a democracy. Finally, a commercial: People concerned about nuclear energy should read the book “India’s Nuclear Energy Program” (INSA 2014) brought out a couple of years ago by Indian National Science Academy, which contains detailed arguments from experts from both sides of the nuclear divide.